Every once in awhile as a photographer, you have to remember to actually be in some of the photos. Although there's very little snow left in the Denver metro area, the same doesn't hold true for Granby. 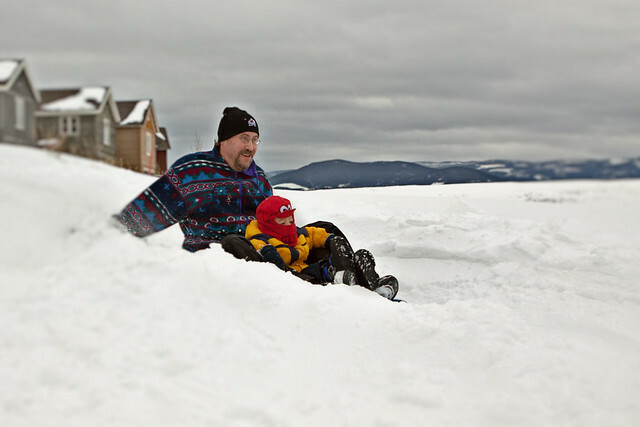 There's a significant amount of snow there, which makes for some fun winter activities. A couple of weeks ago when we were at the cabin for 10 days, we discovered our neighbors next door (whom we get along with really well) had not only taken their 3 year old grandson sledding in the backyard, but they had actually built a sled run, complete with walls. Over the course of that 10 day period, we helped them build it up more, get it further, and pack it down. 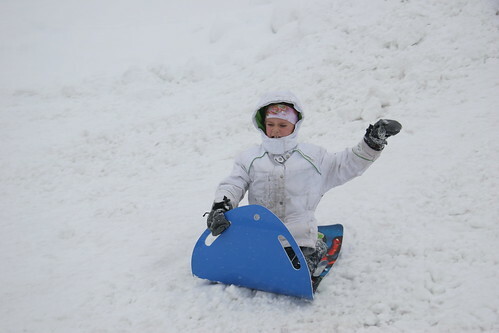 It made for a very fast, and very fun sled run, not just for Peter, but for us as well. Over the weekend we were up there again, and although there had been new snow, it took some minor digging from Leif to make it a good sled run again. We took turns on the sled with Peter. You do have to steer during the first part of the run, but the last part is a nice straightaway, so you can just go all out if you want. I brought the camera out to get some photos. Minor blurring done in FocalPoint after the fact. 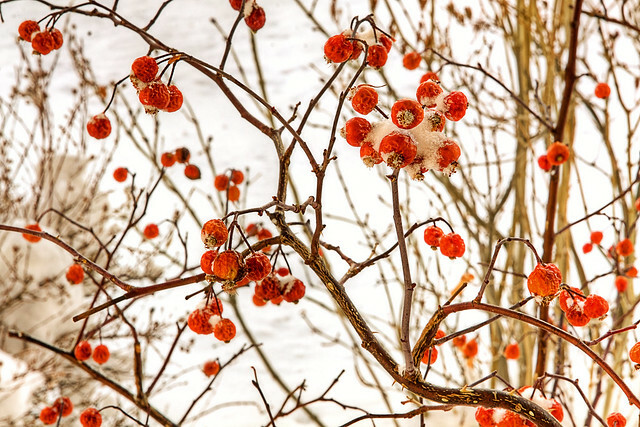 Read more about Stupid Berries, It's Winter and Snowy! I've long loved where I live in Colorado. We have a good view, and fantastic neighbors. 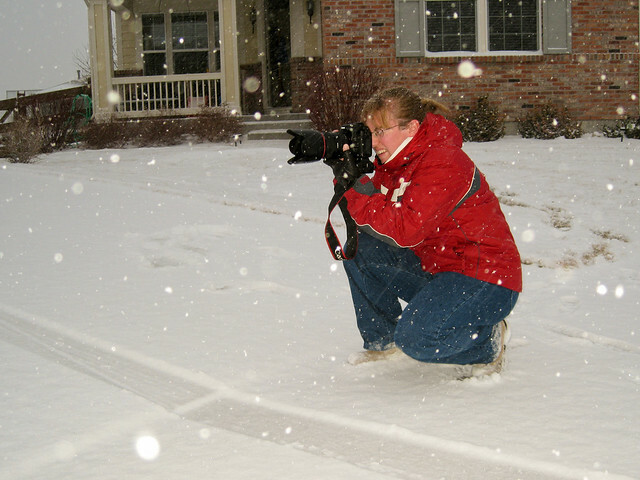 It's a great way for me to practice my photography, especially when we get a snowfall. We got some nice snow over the weekend, so I took the opportunity to go out just around the house and take some shots. It was 5 degrees outside, so I didn't last long, but I took this one in the backyard. I had to keep shooing the dogs away so they didn't jostle the tripod. My goal was to shoot the neighbor's pine tree with the mountain in the background, and this is the shot I liked the best, because of the other foreground elements, giving it a sense of depth. Being from Sweden, Leif seems to be able to handle cold much better than most people. Even in the winter, I rarely see him wear pants unless we have to go out someplace or it's below 0. He rarely even wears a jacket, insisting he's fine in a sweatshirt. This is also the same guy who constantly complains the bedroom is a sauna, even if the window is open in the winter. I'll add as well, that when he's gone on a business trip and it's just me and the dogs in the bed (the dogs only sleep in the bed when he's gone), and I have the winter closed, it's perfectly comfortable, so I'm guessing he just radiates a lot of heat. 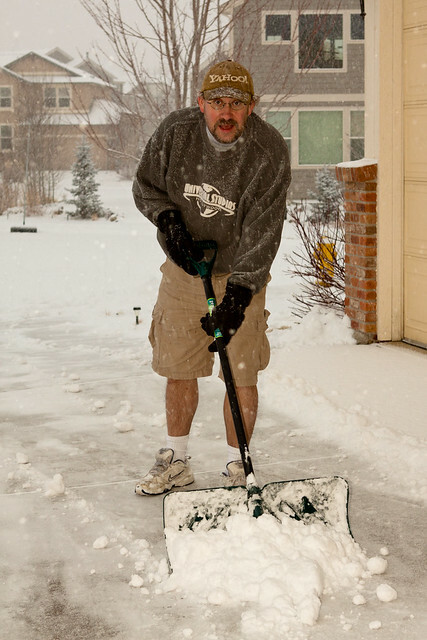 The funniest thing though I see him do every winter is shovel the driveway while wearing shorts and sneakers. It just feels wrong. The following has been the routine since roughly mid-December. Wake up in the morning, look out the window, see that it's snowed. Try and figure out how deep it is to decide if we need to wear ski pants and/or boots to take the dogs out. Anything under 2 inches is sweats and an old pair of sneakers. Feed the hyperactive dogs, take them out. Curse the fact that you forgot to wear socks and get snow on your bare ankles. Curse the dogs for always having to go in the deepest part of the yard. Look at the driveway. 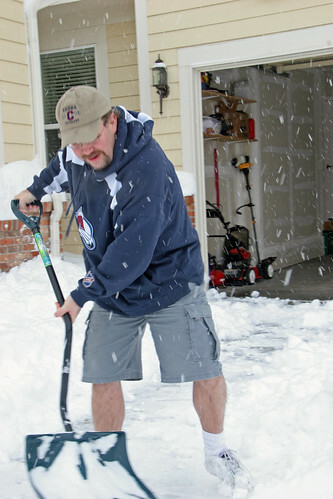 Depending on how much accumulation there is on the driveway, either plow or not plow at this time. How hard it's snowing doesn't matter. 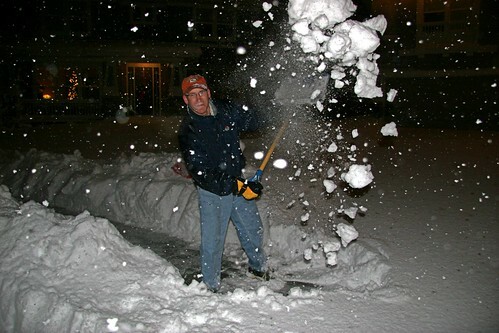 Remember the blizzard when there was 2 feet of snow on the driveway and begging the neighbor to use his ATV plow to do it. Vow to never let 2 feet of snow accumulate on the driveway again. If outside plowing/shoveling, yell to all the other neighbors doing the same thing. Strike up various conversations with them. 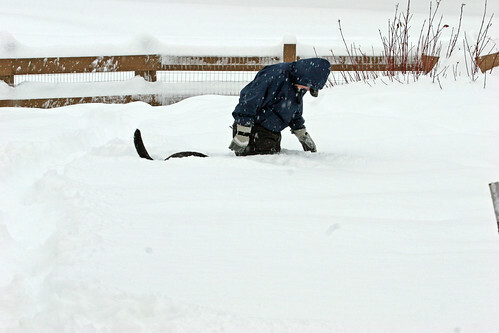 Watch the kids play in the all the snow piles on your lawn, sometimes making them fall on your nicely shoveled driveway. Realize it doesn't matter since the snow just started coming down harder and you'll have to plow again in a few hours. 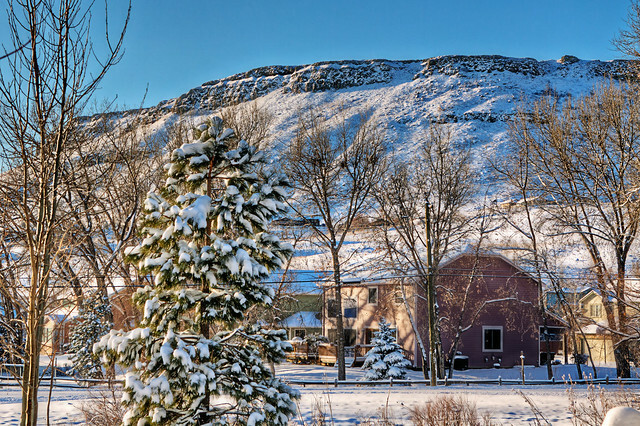 Join the club and help the kids make snow jumps and little hills. Watch how easily amused they are. 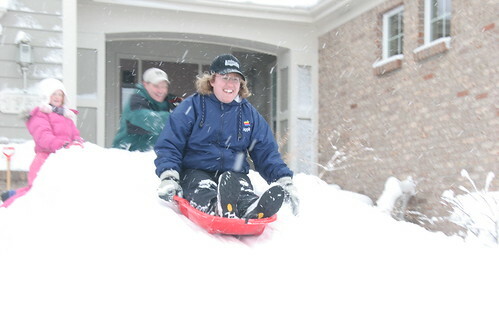 Realize you're still a kid and join in the sledding. Repeat the process every few hours until it finally stops snowing. 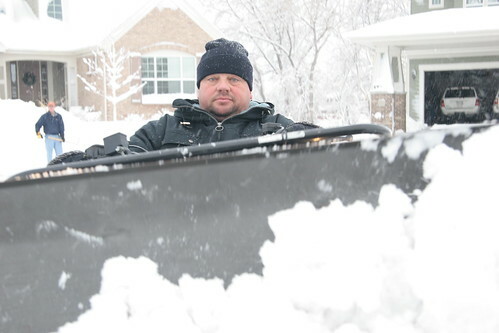 Over the next few days, watch the snow start melting, and breathe a sigh of relief you don't have to shovel again. Each morning try to convince the dogs to NOT go to the bathroom in the deepest part of the yard like they enjoy doing. 5 days later, watch the weather report where they once again predict snow. Read more about Loving This Weather! 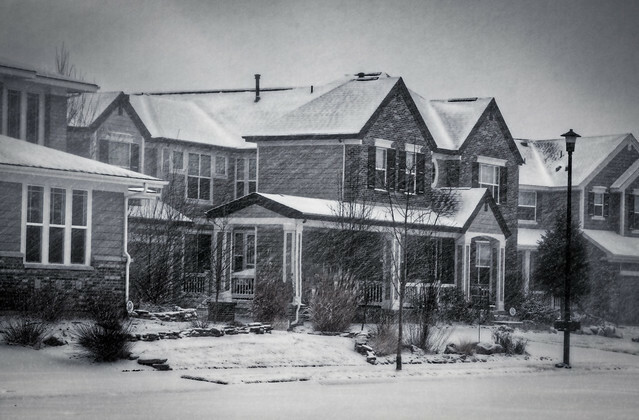 Well, if you've watched any sort of news today, no matter where you are, you've probably heard about the big blizzard that hit the Denver area today. With nowhere to go, and no place important to be, it's been a pretty fun day actually for me. Probably not for the people stranded at the airport though. All the schools were closed today (as well as tomorrow), so I had several neighborhood kids over this morning to watch movies (High School Musical, and Elf), and play Xbox 360. Kids get so restless! I guess I was the same way as a kid, but I swear towards the end of Elf they all wanted to finish it, but were extraordinarily fidgety. I sent them home for lunch, then went next door since Karyl was home (school teacher), and we made the dough for sugar cookies. 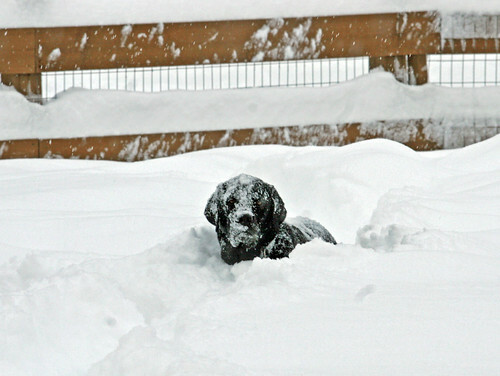 Then we decided the snow was deep enough, so off into our backyard it was to play with the snow puppies. Loki and Odin were soooo happy to have so many friends play with them, they didn't know which way to turn. We buried Loki in the snow up to his neck, and threw the football for them and watched them dig and act like little bunny rabbits jumping up and down in the snow drifts. Then it was an hour of silence as they went off to build a snow fort, then back to Karyl's to finish the sugar cookies, and then just general hanging out the rest of the afternoon/evening until it was dinnertime. Cathy brought over some chili she had made, and we had that, sugar cookies, cheese and crackers, and beer. 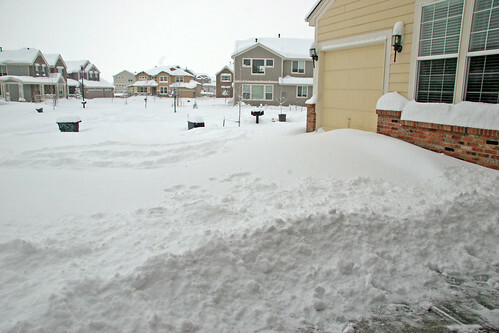 We gave up trying to plow the driveway - the drifts were too deep and even now it's still coming down like mad. Brian tried to do his and our driveway with his 4x4, but it got snowed over too fast, so he decided to wait as well.